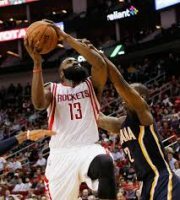 HOUSTON -- After scoring a sub-par 12 points on Saturday night, James Harden redeemed himself with 45 points to lead the Houston Rockets to a 110-98 victory over the Indiana Pacers on Saturday afternoon at the Toyota Center. The weekend matinee, which was part of the NBA's Martin Luther King Day offering, allowed the Rockets to bounce back after getting creamed by the Golden State Warriors on Saturday night. Harden was deadly efficient, nailing 7-of-12 triples and 12 of 18 field goals overall. The "Beard" dropped 18 points in the third quarter and had seven assists and four steals in 40 minutes of action. Harden was also terrific from the free throw stripe, a near flawless 14-of-15. All-Star center Dwight Howard complemented Harden's explosion with 14 points and 17 rebounds, his 19th double-double of the season. Corey Brewer also contributed 13 markers off the bench for Houston's cause. while Donatas Motieijunas pitched in 10 points and nine boards. Despite falling short, the Pacers, using a well-balanced offense, made it exciting in the last two minutes of the fourth quarter by cutting a 24-point deficit down to eight. But the 6-foot-6 Harden came roaring back and pushed the Rockets safely ahead with timely baskets. Both of the Pacers top scorers came off their bench -- C.J. Miles with 23 points, six boards and five steals and Donald Sloan with 17 points and six assists. Solomon Hill had 13 points for Indiana, which dropped to 11th place in the Eastern Conference with a 15-28 won-lost record. The Rockets, meanwhile, improved to 29-13, fourth place in a super competitive Western Conference. Photo: James Harden was simply too much for the Pacers, scoring 45 as Houston pummeled Indiana, 110-98.